If you have been thinking about various ways you can remodel your attic and turn it into something truly amazing, but you still haven’t come up with any appealing ideas, please continue reading. Below, we’ve listed a couple of ideas you can turn to if you’re planning on remodeling your attic. They will make the entire process much more practical, and will leave you with an additional functional living space. So, let’s dive right in, shall we? Can you access your attic easily? Are the folding stairs the only way to access it? If yes, it would be a good idea to rethink this access point. Now, since installing a permanent staircase requires a significant amount of room (around 60 ft2) and can be quite costly, you need to consider the alternatives. For example, you can choose to install a spiral staircase that can be made of reclaimed wood. This idea is functional, beautiful and environmentally friendly. And the best thing is you can even turn this into a DIY project if you have the means and the know-how. If you’re planning on turning your attic into an additional living space, you’ll need to make sure that it gets enough natural light. However, if the room you’re planning on creating in your attic is only going to be used as a bedroom, then there really is no need to install additional skylights. So, depending on the purpose, consider installing either additional skylights or layering various lighting solutions. Remember that LED light is excellent at mimicking natural light and is very eco-friendly as well. The next step of your attic remodel focuses on your floor. So, apart from making sure that your attic floor is safe for use, you can also browse various attic flooring solutions and try to find the one that will not only be durable, but preferably offer a dose of additional sound insulation. That way, you’ll be planting two trees with one seed, as you’ll be taking care of both safety and functionality of your flooring. Walls are another thing you need to pay attention to when remodeling your attic. Since attics usually only serve as additional storage space, the wall insulation is usually either very poor or nonexistent. That’s why you need to find the appropriate insulation solution for your walls that will be efficient, eco-friendly and preferably not too pricey. Insulation made of recycled materials is a particularly popular option in this day and age. Once that is done, paint your walls in a preferred shade and enjoy your new piece of heaven. Finally, style up your new room for maximum comfort. 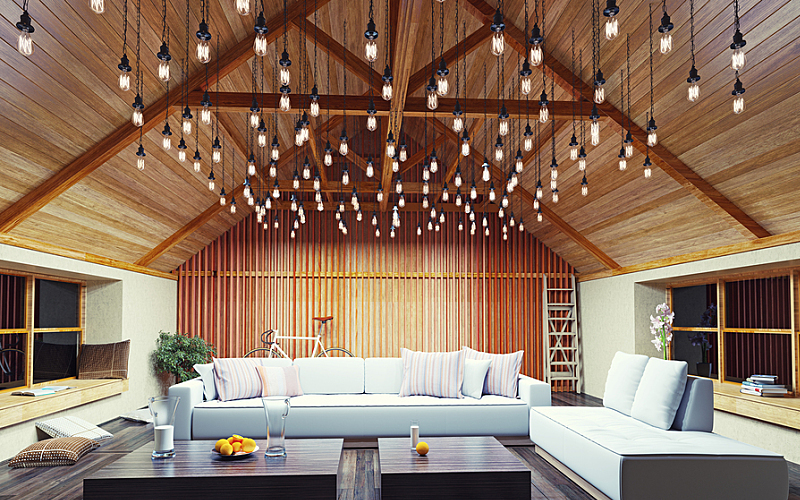 For example, instead of removing all the wooden ceiling beams (which usually even serve a supporting purpose) you should turn them into a statement piece of your design. To achieve that, make sure you clean them thoroughly and treat them to a fresh coat of paint or lacquer. Next, fill your room with cozy materials and textures like fluffy floor rugs, soft throw pillows and romantic sheer curtains. Finish the design off by adding interesting decor items throughout the space. These were just some of the examples of an attic renovation project done right. If you let your imagination run wild while trying to stay eco-conscious as much as possible, you’ll end up with a beautiful space in no time. So, what are you waiting for? Roll up those sleeves and get to work!